Jeremiah Chapter 25 Star Chart: Clockwise "from the thirteenth year of Josiah the son of Amon king of Judah, even unto this day, that is the three and twentieth year, the word of the Lord hath come unto me, and I have spoken unto you (Gemini), rising early (red sunrise) and speaking; but ye have not (Cancer lunar ear) hearkened" (25:3) "and the Lord hath sent unto you all his servants the prophets (Gemini), rising early (red sunrise) and sending them; but ye have not (Cancer lunar ear) hearkened, nor inclined your ear to hear." "For thus saith the Lord God of Israel unto me; Take the wine cup of this fury at my hand, and cause all the nations, to whom I send thee, to drink it (red radius line connects lunar red cups all around the Zodiac). And they shall (radius red line) drink, and be moved, and be mad, because of the (red radius line) sword that I will send among them" (25:15-16). 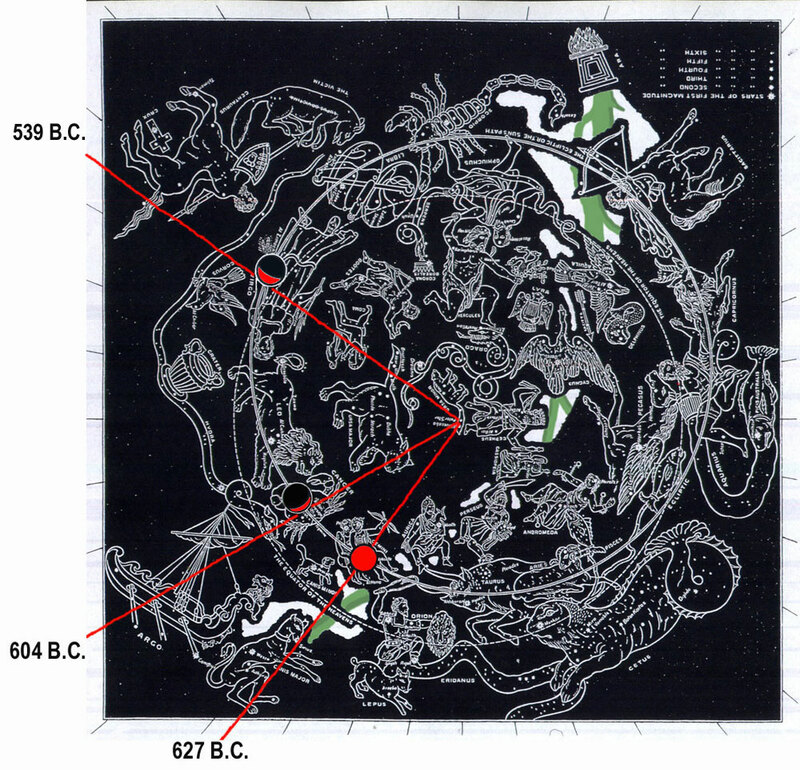 Clockwise from 627 to 604 B.C. is 23° years when Nebuchadnezzar took Jerusalem in 604 B.C. resulting in tribute being paid by King Jehoiakim. But Jerusalem actually went into exile in 597 when the court of Jehoiachin was removed (2 Ki. 24) and then again in 586 Ab when the court of Zedekiah was removed. Judah as a whole did not actually go into exile until the 19th year of Nebuchadnezzar, which was Ab 10, 586. But Jeremiah had been speaking God's word to them since the 13th year of Josiah, which was 627. It was the Northern Kingdom that started serving the king of Babylon in 609. So Judah got 23 years of denunciation followed by 47 years of exile and servitude, whereas the Northern kingdom and the kingdoms around about got 70 years of servitude. Jerusalem got 12 years of denunciation followed by 58 years of exile. The exile from Jerusalem and of Judah ended with the decree of Cyrus in his first year of 539 B.C. "And this whole land shall be a desolation, and an astonishment; and these (Gemini) nations shall serve the king of Babylon seventy years. And it shall come to pass, when seventy years are accomplished, that I will punish the king of Babylon (609 to 539 B.C. ), and that nation, saith the Lord, for their iniquity, and the land of the Chaldeans, and will make it perpetual desolations" (25:11-12). From 609 B.C. when the Egyptians came to the aid of the Assyrians at the city of Haran on the Euphrates and were defeated by Nabopolassar -- father of Nebuchadnezzar -- and all the nations between Mesopotamia and the border of Egypt began to serve the King of Babylon from that time on (609 B.C.) till Cyrus and his army came and destroyed Babylon in 539 B.C. are the 70 years. In 609 B.C. Harran, (in Syria) the last Assyrian stronghold, fell to the Babylonians led by Nabopolassar. In the spring of 609 BC, Necho II of Egypt led a sizable force to help the Assyrians. At the head of a large army, consisting mainly of mercenaries, Necho took the coastal Via Maris into Syria, supported by his Mediterranean fleet along the shore. He preparing to cross the ridge of hills which shuts in on the south the great Jezreel Valley, but he found his passage blocked by the Judean army. Their king, Josiah, sided with the Babylonians and attempted to block his advance at Megiddo, where a fierce battle was fought and Josiah was killed. Necho continued on and joining forces with Ashur-uballit, they crossed the Euphrates and laid siege to Harran. Failing to capture Harran, they retreated to northern Syria. Nabopolassar was able to compel the former vassals of Assyria, as far as Palestine and Cilicia, to pay tribute to him. The Northern Kingdom of Israel was already under the authority of Nebuchadnezzar since the fall of Nineveh, the Assyrian capital to the Babylonians in 612 and then the fall of Harran, their secondary capital, to Nabopolassar in 609 - Cambridge Ancient History - Wikipedia. For the Assyrians ruled Samaria until they were defeated by the Babylonians. But the Babylonians implemented exile programs. 3 From the thirteenth year of Josiah the son of Amon king of Judah, even unto this day, that is the three and twentieth year, the word of the Lord hath come unto me, and I have spoken unto you, rising early and speaking; but ye have not (Cancer ear) hearkened (from 627 B.C.). 4 And the Lord hath sent unto you all his servants the prophets, rising early and sending them; but ye have not (Cancer ear) hearkened, nor inclined your ear to hear. 7 Yet ye have not (Cancer ear) hearkened unto me, saith the Lord; that ye might provoke me to anger with the works of your hands to your own hurt. 9 Behold, I will send and take all the families of the north, saith the Lord, and Nebuchadrezzar the king of Babylon, my servant, and will bring them against this land, and against the (Gemini) inhabitants thereof, and against all these nations round about, and will utterly (red radius line) destroy them, and make them an astonishment, and an hissing, and perpetual desolations. 10 Moreover I will take from them the voice of mirth, and the voice of gladness, the voice of the bridegroom (Cepheus), and the voice of the bride (Cassiopeia), the sound of the millstones (black moon not white millstone), and the (red radius line) light of the candle. 11 And this whole land shall be a desolation, and an astonishment; and these (Gemini) nations shall serve the king of Babylon seventy years (609 to 539 B.C.). 12 And it shall come to pass, when seventy years are accomplished, that I will punish the king of Babylon (609 to 539 B.C. ), and that nation, saith the Lord, for their iniquity, and the land of the Chaldeans, and will make it perpetual desolations. 15 For thus saith the Lord God of Israel unto me; Take the wine cup of this fury at my hand, and cause all the nations, to whom I send thee, to drink it (red radius line connects lunar red cups all around the Zodiac). 16 And they shall (radius red line) drink, and be moved, and be mad, because of the (red radius line) sword that I will send among them. 26 And all the (Gemini) kings of the north, far and near, one with another, and all the (Gemini) kingdoms of the world, which are upon the face of the earth: and the king of Sheshach shall drink after them. 27 Therefore thou shalt say unto them (Gemini), Thus saith the Lord of hosts, the God of Israel; Drink ye, and be drunken (rotate around the Zodiac), and spue, and fall (below the horizon), and rise no more, because of the (red radius line) sword which I will send among you. 28 And it shall be, if they refuse to take the (solar or lunar red) cup at thine hand to drink, then shalt thou say unto them, Thus saith the Lord of hosts; Ye shall certainly drink. 29 For, lo, I begin to bring evil on the city which is called by my name, and should ye be utterly unpunished? Ye shall not be unpunished: for I will call for a (red radius line) sword upon all the (Gemini) inhabitants of the earth, saith the Lord of hosts. 30 Therefore (red radius line) prophesy thou against them all these words, and say unto them, The Lord shall roar from on high, and utter his voice from his holy habitation; he shall mightily roar upon his habitation; he shall give a shout, as they that tread the grapes, against all the inhabitants of the earth. 31 A noise shall come even to the ends of the earth; for the Lord hath a controversy with the (Gemini) nations, he will plead with all flesh; he will give them that are wicked to the (red radius line) sword, saith the Lord. 33 And the slain of the Lord (black Zodiac) shall be at that day from one end of the earth even unto the other end of the earth: they shall not be lamented, neither gathered, nor buried; they shall be dung upon the ground. 34 Howl, ye shepherds (Gemini), and cry; and wallow yourselves in the ashes, ye principal of the flock: for the days of your (red radius line) slaughter and of your (red radius line) dispersions are accomplished; and ye shall fall like a pleasant vessel. 35 And the (Gemini) shepherds shall have no way to flee, nor the principal of the flock to escape. 36 A voice of the cry of the (Gemini) shepherds, and an howling of the principal of the flock, shall be heard: for the Lord hath spoiled their pasture.